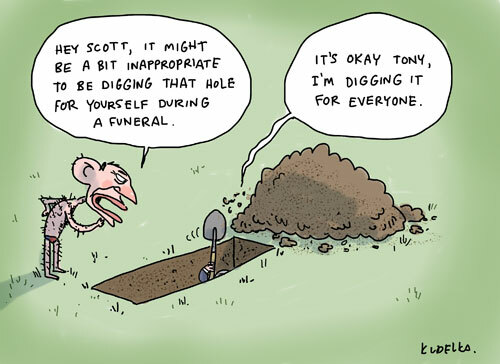 Dear Scott, the appropriate time to whip up racism for political gain is never… and Tony, while we’re handing out advice of the bleeding obvious variety, a big man doesn’t let this sort of crap go on during his watch. Cheers chaps, hope this helps. …and because it’s Sunday,Â here’s the wordier version. ← Does this wig make my heart look small? I find your style so interesting that I’m currently reading all your blog (and this can explain why you will find my comments on those old posts). I have a question here is: do you generally start writing a whole short story like the unpublished rough, as a stepping stone to get to the one-cartoon punch line? Or do you imagine both from the beginning and try which version is funnier? When I write comics I have in mind the short story (a sequence with 3 or 4 panels, at the very least) but I don’t know how to sum it up in just one single cartoon and the process fascinates me.